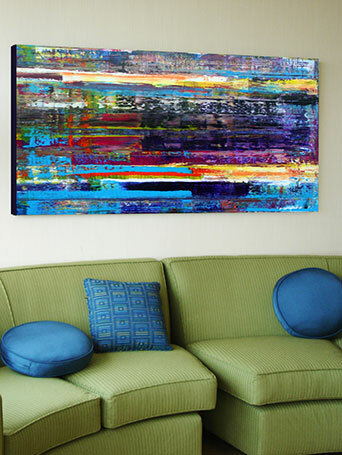 LARGE, CONTEMPORARY MODERN ABSTRACT ART PAINTINGS FOR SALE FOR THE HOME OR OFFICE. Welcome to my website. 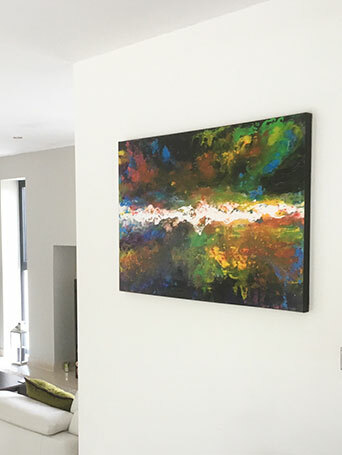 I am a professional artist with a big passion for creating large scale colourful original abstract and modern art. There are various sizes of modern paintings available for sale, with prices to suite every budget. Worldwide shipping is available on all paintings. If you have any queries or would like help choosing a piece of wall art for your home or office, please get in touch. All my paintings are one-off originals delivered signed, dated and ready to hang with a certificate of authenticity. All my paintings are delivered free to any UK mainland address, within seven working days by professional courier. For complete peace of mind and to see the art in your own home, I offer a 14 day no hassle money back guarantee. Send me an image of your room and I will photoshop any of my art into the image and email it back to you FREE of charge. Looks even better in real life. There's a real depth to the paint. Thank you! Fabulous work of art, love it thank you. Fabulous work of art & very impressed with your service. Fantastic Quality, very pleased with purchase. International delivery was at a very reasonable cost. Stunning. One of those paintings that lifts your mood. Superb! Looks great on the wall, a brilliant piece. If you have seen a painting you love, but it is not the size you are looking for, please get in touch. I can often re-create the painting to your specific size requirements. If you have seen a painting on my site but it is not the exact colour you are looking for or you want to add extra colour to match your interior decor. Get in touch and send me your colour requirements. I am very happy to work colour into existing paintings, or if I feel the colour may not work, I can work with you to re-create the paintings to your specific colour requirements. Most of my paintings are created on single canvases, but if you have seen one of my painting you love, but feel a Diptych (Two canvases) or Triptych (Three canvases) would better suit your interior space. Again get in touch with me, always happy to help and I can work with you to re-create your perfect painting across multiple canvases. There is no extra cost for Commissions. As a guide commission prices are the same my website prices. Any size can be created, so please get in touch. I would love to hear from you. If you would like to see any of my existing art on your wall space or in your room, I offer a FREE "See Before You Buy" service. Simply email me a photo of your wall and rough measurements (For best results take the photo high quality about 4mb size is great. A straight on image is best, try to include items in the room for example: a sofa, chair, sideboard or table, as this gives me a sense of scale and also gives you a more realistic idea of how the painting will look in your room). I can photoshop any of my art into your room setting and will send it back to you, to give you a better idea how the art will look in your interior. If you want to go a step further and to see the art in all its colourful glory, I offer a 14 day no hassle money back guarantee. Giving you time to view any of my paintings at your leisure in your own home!